I need to make a retraction, as to my previous blog, where I referred to my very first flight being with my cousin Harold Colbert. 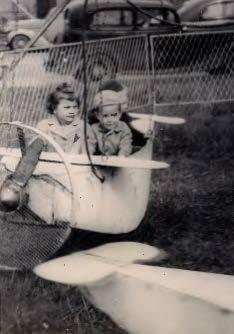 Actually, as you can see in this photograph (which I resurrected only today), my first time in an airplane was with my kissing cousin Patsy. It is clear to me in this photo that she was in charge, even though I was in the left seat. It is generally assumed that the pilot in command of an airplane sits in the left seat, and is known as the captain. But, as I recall it, Patsy was always in charge no matter where she sat. I lost my friend Patsy recently. It has been many years since we went our separate ways after High School and I only remember her as Patsy Baron. I guess it comes with the territory, of now living into my mid-seventies, that separated by time and distance, I probably have lost many old friends that I am not aware of? Patsy’s parents, John and Barbara, were the best of friends with my parents during a difficult period in our countries history. Beginning in the depression era with the Civilian Conservation Corp. and the Second World War which followed, they remained friends for as long as I can remember. We socialized so much during our younger years, I always thought of Patsy and her siblings as cousins. 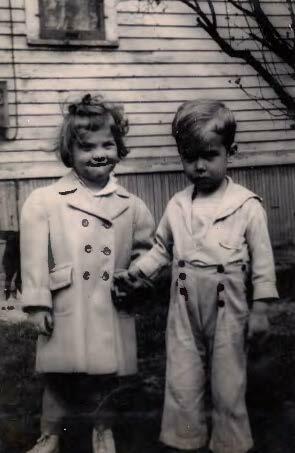 Encouraged by our parents… I think we would be what were then known as… kissing cousins. Patsy took charge of that as well. Keep in mind, in these pictures we were only three years old at the time. I think I was a little older but not by much. I am sorry I wasn’t able to stay in touch with Patsy and her family during these past 50+ years. I would want her to know that she always had a place in my heart, along with the fond memories of the family friendship we shared. Great reading about Chicago – where are links to your art? Thank you for the pictures and memories of mom.